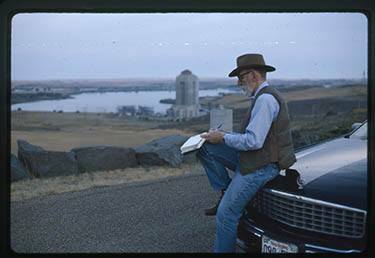 Ivan and Cadillac at Fort Peck Dam, 1994. The photographic collection of the Ivan Doig Archive contains 35mm transparencies taken during Ivan's travels with his wife, Carol Doig, and while conducting research for his writing. There are also dozens of photographs and family portraits from Ivan's youth, including a Doig Family photo album. 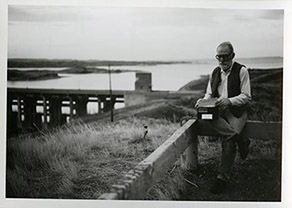 In this iconic photo taken by Carol Doig (exact date unknown), Ivan Doig is reviewing his note cards at the Fort Peck Spillway Dam which inspired his novel Bucking the Sun (1996). The novel, set in 1938, features the Duff family, all of whom are employed at the Fort Peck Dam. These family photo albums came into Ivan Doig's possession after the passing of his grandmother, Bessie Ringer. 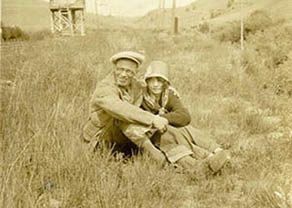 In a note typed by Doig at the beginning of the album, he states, "The photos are mostly from the areas near Sixteen and Ringling, Montana, where my parents grew up... These albums were in Grandma's keeping for years. At Christmas, 1973, she went through the pictures with me and named everyone she could". Some of the photos feature Doig's mother’s handwriting.